A true inspirational story about beating the odds. 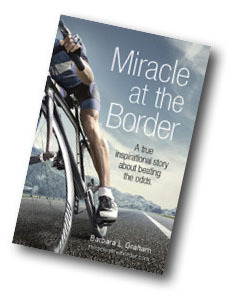 Start reading Miracle at the Border! Trauma arrives sharply, delivers a strong blow and leaves indelible scars. It causes shock and instability but if we are fortunate enough to have the support of strong relationships around us, we can, and will make it through. As I sat on the deck in the warmth of the day and felt completely content and pleased with my life, I simply could not imagine anything being different. At 1:25 pm on that idyllic afternoon however, the doorbell rang and my life changed forever. A nurse slowly and gently guided me into Jim’s room. I gasped and immediately felt tears pouring down my face when I saw the blur of a million tubes and wires and a maze of intravenous bags on the left of the bed. On the right were machines and wires going everywhere, and at least a dozen people standing by the wall. I heard sounds I’d never heard before coming from machines attached to my husband. The blood rushed from my head and nausea swept through me but I managed to gingerly step over and around things to get to his bedside, reeling in overwhelming sadness and fear. I could not see Jim’s face as it was covered in medical tubes and bandages but I did see blood on his face. As I reached to touch him, I heard someone say, “No, don’t touch him.” My knees gave way as I crumbled to the floor while sobs rose up from my core. Time stood still and a primal scream came from deep inside me as I sensed the pain of my impending loss. Laughter and tears seem to be very close siblings. Humour has always been my go-to in both happy times and in difficult ones. There is a sense of relief and connection through laughter that I have always appreciated. I know, without a doubt, and from a lot of experience, that laughter helps to relieve tension and calm the body. Jim’s nurse, a very tall and very handsome young man named Michael, appeared in the cubicle to introduce himself and with a huge, sunny disposition said he would do whatever he could to help. He was the kind of nurse that anyone would wish for: thoughtful, helpful, kind, encouraging and obviously comfortable with his work. Because of the exemplary and totally loving care we received from absolutely everyone at St. Joseph in Bellingham, we thought that all medical staff would be the same — and lucky for us, here was proof positive! It was just Michael’s natural style and he had such a special way with Jim and spoke to him in a ‘man to man’ kind of way, especially a few days later after Jim had wakened, saying things like, “Come on Jim, if you are going to stand up, stand up like a man!” and, “Be proud, you can do it!” It was obvious that Jim responded to Michael in a way that made him work harder and with more pride. Whenever Michael used his strong and direct voice to encourage Jim, we saw Jim look up and react positively and push himself to do more each time. Michael was also very caring in terms of Jim’s physical care. Jim was one who was very particular about being clean and tidy in appearance and Michael seemed to know that before we could even tell him. When we came in each day, Jim had been shaven and his hair combed and his bed tidied up and neat looking. We were grateful for all this care because we knew that it was so important to Jim. Without the CaringBridge postings, we could not have remembered what had happened that day, let alone the day before. We spent a lot of time reading through those postings and replies and gaining so much support from the personal responses that helped to fuel us for the next day. I found it interesting, though, that because I didn’t have phone calls and emails to reply to, there were moments that I actually felt disconnected from everyone outside the hospital and I felt as if it were all a bad dream. Many times I wished it were just a bad dream because those eventually pass. There were times that I dearly missed my normal life outside the hospital and wondered if I would ever feel that normal again. Still, we felt blessed that Jim was still with us and we had the hope of another new day with him, regardless of what it brought. …about two out of three patients who have been in ICU and in particular on a breathing machine, will experience delusion which is caused by a number of things including less oxygen than normal to the brain and certain medications. To my knowledge, Jim had certainly experienced a shortage of oxygen due to his cardiac arrests and he had been loaded with medications to help him cope with all the procedures. Kris’s friend, a medical doctor explained to us that delirium can show itself through unclear thinking, problems with paying attention, and hearing or seeing things which are just not there, but appear absolutely real to the patient. And Jim was experiencing visions, or hallucinations, of all sorts of things that we could not follow. He expressed disgust at seeing his body and in particular, his feet, change from normal form to that of fins on a fish and we understood why he would think that. He actually was swollen from all the drugs and procedures. He also described people coming into the hospital to a sales counter to sell their body parts as part of the organ transplant program and doctors accepting those parts in exchange for money. He recounted many details of loud and boisterous parties late at night and of the floor dropping down to create a dance floor by 10 pm to accommodate those parties. There were numerous doctors who appeared out of nowhere and Jim seemed to know them, but we had never heard or met any of them. Part of Jim’s chatter included medical devices, described as parts specifically designed to be used in medical treatment, and because he was CEO of a medical device company himself, he spoke with authority and knowledge, but often got tripped up confusing his visions and his reality. He was given a breathing apparatus to help his lungs to work better and after trying to blow a few puffs into the device chambers, he turned it over and claimed that it could be improved by a new design and actually thought of a way to make it happen. Even though his voice was weak, his brain never stopped. Even though we knew that he was probably delusional, it became increasingly disturbing and uncomfortable to us. We really didn’t know what to do. Should we point out to him that these sites were just visions to him, that they weren’t real at all? Should we argue that parties never happened there? Should we tell him that the doctors who mysteriously appeared to him were not real? We were totally stumped. What we didn’t share were the darkest, deepest moments of doubt, confusion and fear while Jim worked at getting back to us. There were moments during the first day especially, seeing him hooked up to everything; overwhelmed with smells and sounds and sites and emotions we had never experienced; being told his condition was grim; that caused us all to go into a despair I did not know was possible. We all sobbed at times during those first days but thankfully it was never at the same time so we were able to support each other when we could. There were times that Jane and Kris and I just stood together, arms around each other, not needing words, just the protection of each other’s presence and love. There were moments of silence that lapsed into the deepest sadness I had ever felt and then I remembered the love and years we had shared and felt awkward for wanting more when we had already had so much. The experiences we had with Jim while he worked his way through the drugs were extremely difficult and just added to the complexity of whether he would return to us intact or not. The roller coaster ride of emotions continued daily. Mandy Yip: A cog in the wheel. A phrase that continues to resonate in every cell of my body to this day. As I stood amongst Mr. Graham’s loved ones in Point Roberts Fire Hall, I felt a tremendous sense of humility as every emergency response personnel and border guard involved in Mr. Graham’s rescue spoke about the extraordinary efforts to reunite Mr. Graham with his family with the greatest sense of personal duty and teamwork. While the emergency call to rescue Mr. Graham was one of many responded by these heroes and heroines who dedicate their lives to saving ours, it was, to Mr. Graham’s family, one that was life-changing and otherwise would lead to the most inspiring experience I have ever had the opportunity to be a part of. Eight months following his cardiac arrests, Jim was nothing short of a marvel. After a month or so at home, he returned to work full time but without any of the travel. At ten months post June 7th, he reduced his work load to part time and at 11 months, following consultations with his doctors, he made the decision to retire completely. He is functioning as he did prior to the event but with some lovely changes. He is far more introspective and appreciative and he is much softer in his approach to life. He shows no signs of stress, his face is relaxed and happy and he is less assertive about everything. His physical strength has almost returned to normal, but his stamina is less than it was before. To my pleasure, he no longer snores — probably as a result of the many days of intubation. His body has strengthened due to his consistent monitored workouts and his muscle is returning. In fact, he is back to looking robust and very healthy with little evidence of his traumatic events. He just might purchase and wear another “sausage suit” yet, and why not? Along with Jim, I find my full capacity for joy returning in leaps and bounds. I use the word “miracle” frequently throughout this story because when the whole thing adds up, there is no other possible definition. It took a series of over a dozen coincidences to keep Jim alive and leave him with absolutely no residual brain, heart or lung damage, simply unbelievable to those in the medical field. While my strongest intent for writing this book was to salute the brilliant team who helped keep Jim alive, especially on June 7th, 2015, it was also intended as a testament to the power of love and support in relationships. Without all the professionals who helped Jim live those first few days and following, and without the impact of all the love and support from those professionals in the hospital in Bellingham and the transport team home, as well as family and friends, and the team at Vancouver General Hospital, the outcome could have been very different. As a testament to the power of love and relationships, our new and treasured friend, Detlef Goellner and his girlfriend, Jana, joined us for Canadian Thanksgiving only 119 days after he helped save Jim’s life. It was a Thanksgiving none of us will ever forget and Jim’s 90-year-old mother got the chance to thank the man who helped save her son. Kris created a beautiful video including speeches of our celebrations at Point Roberts and the hospital in Bellingham to show everyone. While it was running with Louis Armstrong singing “It’s a Wonderful World” quietly in the background, there wasn’t a dry eye in the house. The whole evening was simply beautiful. Access to the video is on the CaringBridge.org website under “update on Jim”. When on the site, click on “Journal” to our Thanksgiving celebration where the video is located. My heart sometimes skips beats while my mind drifts back to all the memories from this experience. It was the most an all-encompassing, emotional, psychological, spiritual and physical experience that I had ever had which made it harder than I thought to write about. On the morning of June 7th, when things still appeared normal for me, I lived in a joyful, positive, loving and forward-thinking head that saw challenges as inevitable, but completely manageable. Yes, difficult things had happened to me and to us and we had always come through together, to the other side where the light always shone. I felt confidant, capable and secure in my own abilities and those of Jim’s and mine, together. After what happened to Jim that day, I learned that things aren’t always black and white, that earth-shattering events can happen in a flash that shake the very core of your beliefs, causing uprooting in every sense. That discomfort means not being able to cope. That hearts and brains are always expanding and that for sure, we cannot control everything. I could have never gone through it without the support I had. I also learned that the medical staff who made an attempt to get to know Jim and all of us, those who actually recognized us as part of Jim’s story, made such a difference to our understanding and our ability to handle the stress. What happened to Jim, and therefore, to everyone around him and beyond, has fundamentally changed us all. To be face to face with imminent death, the reality that nothing is permanent and nothing can ever be taken for granted again, is such a huge lesson in understanding our presence here on Earth. To learn that love can be unconditional when your life is saved. Our love for Detlef and all those who followed him in caring for Jim is, indeed, unconditional and I have never felt that other than when our babies were born. Life is a beautiful and brilliant teacher.